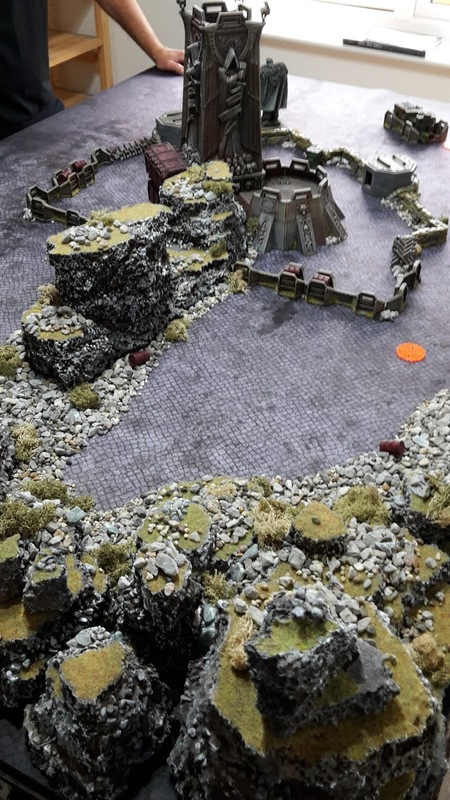 Today, I have another video battle report for you. 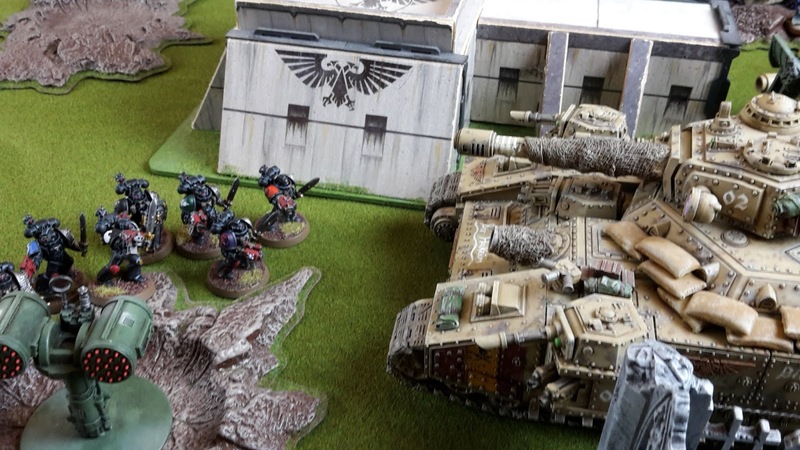 In this game, my Dark Angels and Deathwatch tournament army take on Mike's Tallarn Astra Militarum in a Warfare tournament practice game. This game features an unusual maelstrom mission, where you get to look at the next cards in advance and can use a stratagem to swap them with your current hand. This gives you good opportunity to plan ahead and maybe score more points in your turn with the right use of the stratagem. 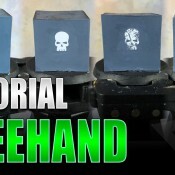 Check out the video and be sure to subscribe to the Youtube channel if you like the reports. 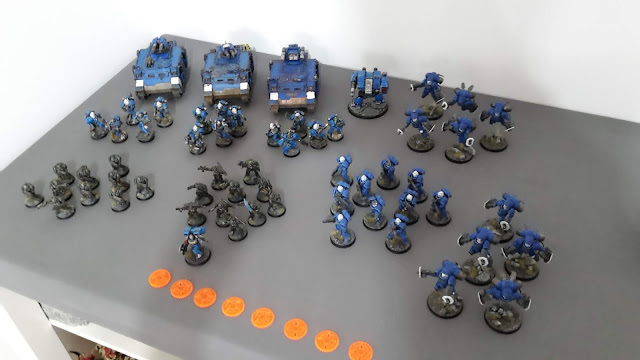 In case you haven't seen it, I recently played a game against Winters SEO, where my Genestealer Cults took on his Ultramarines. It was a blast of a game that went right down to the wire. You can check it out on Youtube, just be sure to say how much you enjoyed it in the comments! Here are some photos I took of the game to give you a taste. 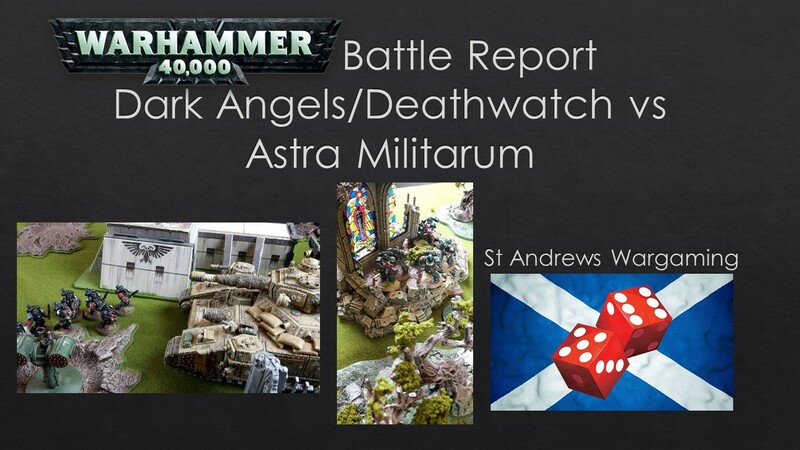 Today I have an army showcase for you, featuring Steven's Astra Militarum force. 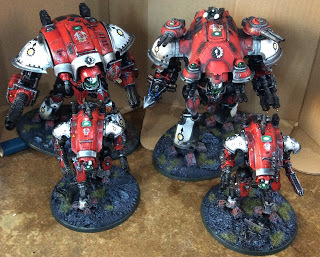 Steven got in contact with me on the St Andrews Wargaming Facebook page a while back with some great pics of his force when I was looking for hobby updates from readers. He was prepping them for a doubles tournament he was attending. The army is a great Astra Militarum armoured company, with a beautiful paint job on the tanks. I got in touch with Steven to get more info on the force and how he put it together. 1. What drew you to the army? 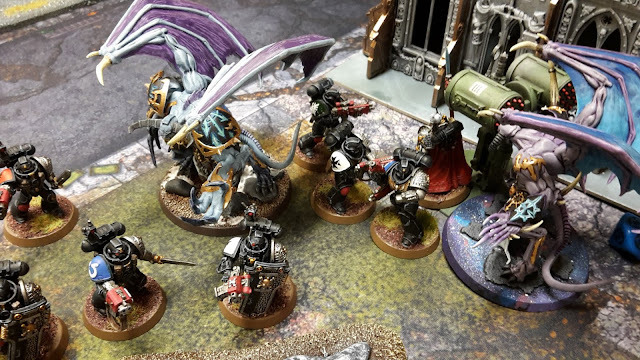 One of my friends has a Tanith army and we decided to go to the 40k doubles tournament at Warhammer World back in October. Because we wanted the army to be themed we started looking at other regiments that the Tanith fought with in Sabbat Worlds Crusade, because his army was 1000 points of pure infantry we opted for one of the tank regiments as we wanted to get past turn 1. 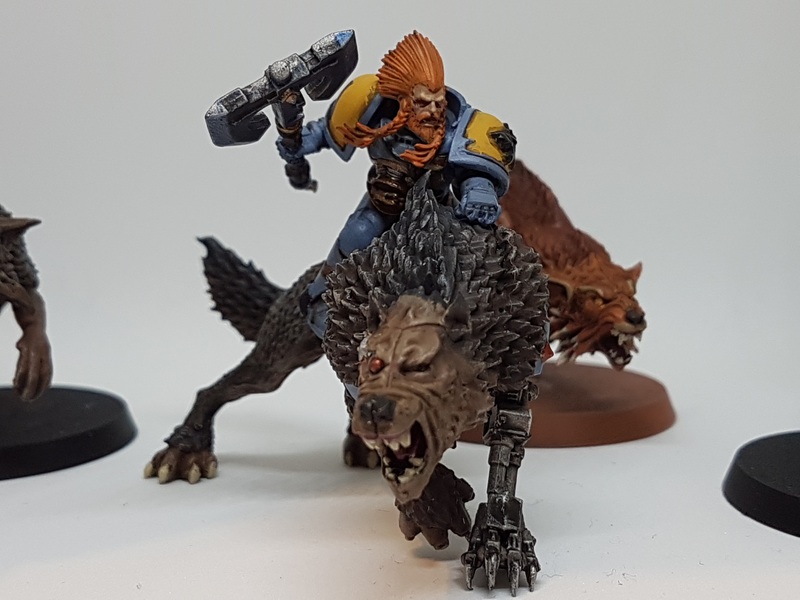 Today's Better Know a Blogger features Dan from Redtoof's Mostly 40k Blog. Dan started his blog earlier this year, and I have been a continuous reader and follower since I discovered it on the 40,000 blogs Facebook page. 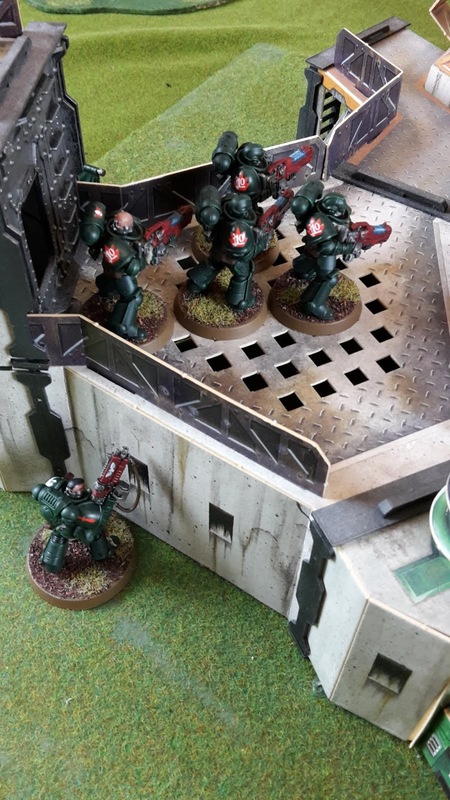 On Redtoof's Mostly 40k blog, you can find a great selection of content, including battle reports, hobby updates and codex reviews. He's also been featuring on a number of video battle reports recently, including a great game with his Tyranids against Winters SEO. 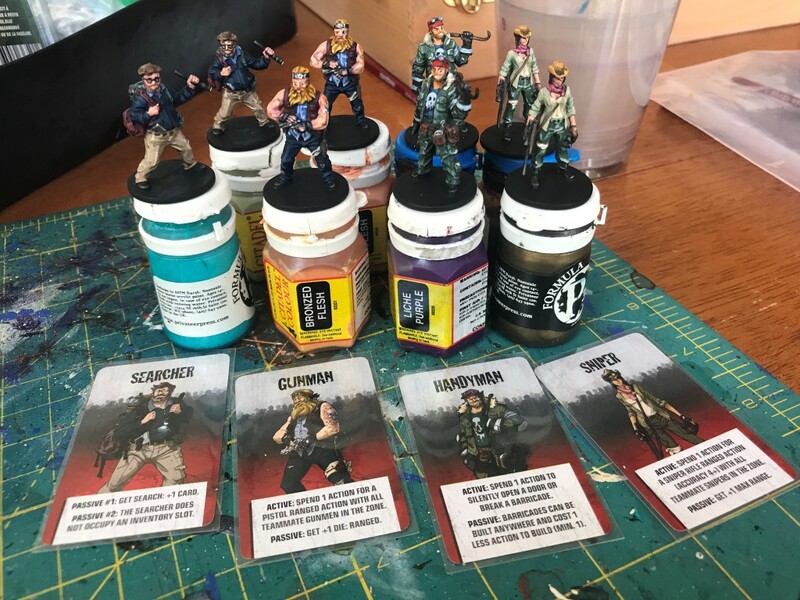 A great recent article was on tournament preparation, featuring some great advice on what to do when you are getting ready for a tournament, delivered in a humourous way. Apologies to Dan for the late posting of this. I've had it sitting for a few weeks and just haven't had the time to put it together. I started getting into gaming at some point during primary school in the 90s and I was about 10 when a model shop arrived in my small hometown in Devon that stocked Citadel Miniatures. 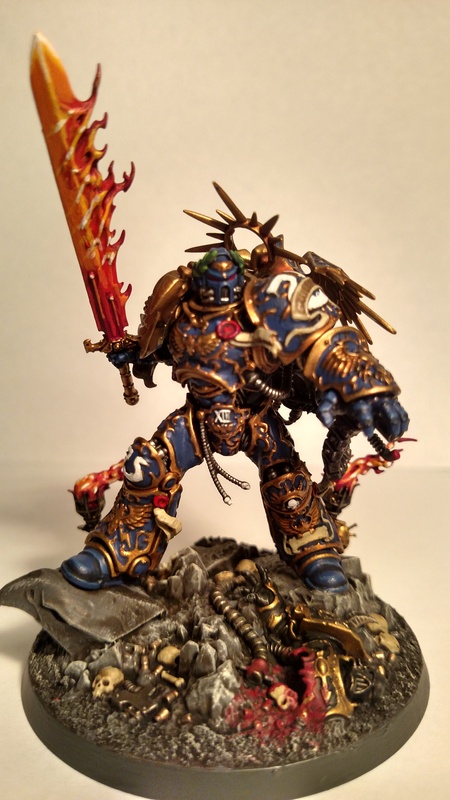 I instantly thought I wanted some of that and started collecting minis, mostly based on what looked cool. 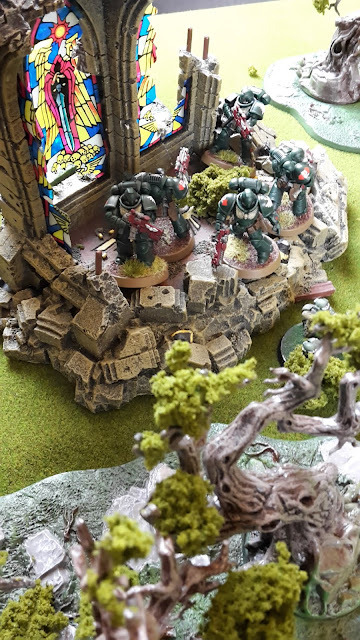 A little while later 3rd edition 40k came out and I got into playing the game ‘properly’, and I haven’t really stopped since. This week's Warhammer 40k battle report is another warfare tournament practice game, featuring my Dark Angels and Deathwatch army taking on Ben's Thousand Sons army. This game featured a custom mission for warfare called The Ritual. This mission features two objectives, with one on the central line, 18" away from each flank. You score two points for each objective you hold at the end of your turn. In addition, if you have a character within 3" of the objective, you can spend up to two command points to score that many bonus victory points, so lots of opportunity to rack up bonus points. In addition, each player gets one command point back at the start of each player turn, but you cannot regenerate command points in this game. Deployment is also a bit of a change. Both players secretly bet a number of command points for gaining first turn. The winner loses the command points, but sets up first and gets the first turn (their opponent cannot seize the initiative). Quite an unusual scenario to play. This is my trial tournament army going forward. 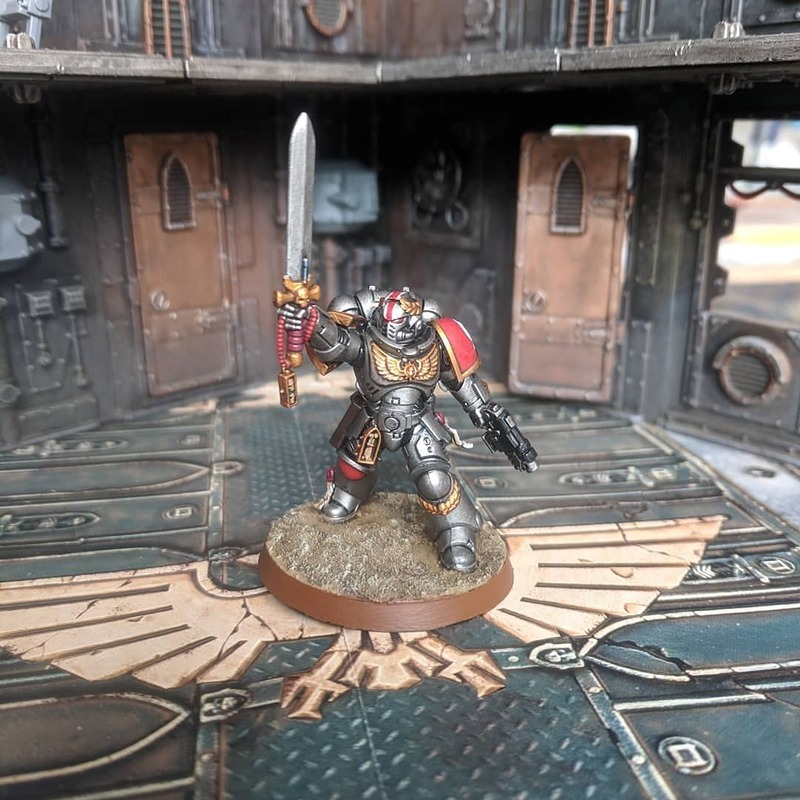 It contains a strong firebase and some great reserves in the Deathwatch. The next part of my Ork Codex review will take a look at the HQ units in the codex. 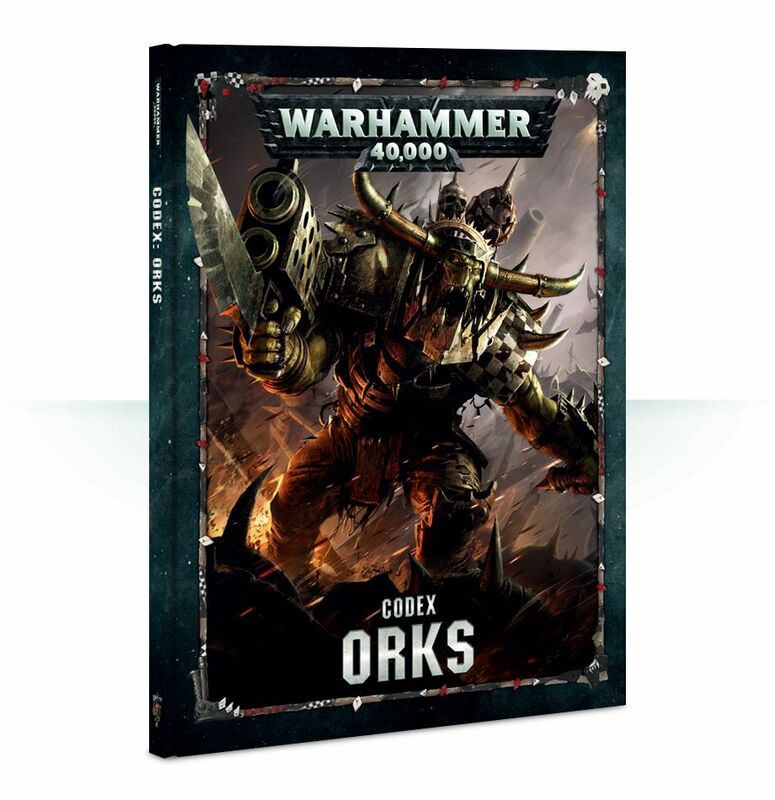 The Warboss is one of the main HQ units in the codex, and the one that I imagine most players will select to lead their army. He is a bit of a combat monster, with WS2+, S6 and 4 attacks. 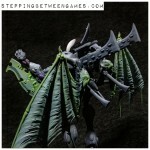 He comes with a Power Klaw, allowing him to hit on a 3+, at S12, AP-3 and D3 damage per wound. He has T5 and 6 wounds, as well as a 4+ armour save. He is fairly durable in combat, but suffers from lack of a good armour save and little way to get an invulnerable save (barring the Bad Moons warlord trait). He hits hard in combat, but can fall quite easily to an enemy unit that has high strength, high damage attacks. He provides some very strong buffs to the army. He allows Infantry units within 6" to advance and charge. This is a very powerful ability for the Orks, who mostly want to be in combat. This can help you get into combat a turn or two early, which makes a big difference against the enemy firepower. He also provides some morale benefits, allowing you to pass a morale test for D3 mortal wounds for nearby units. May not be of much use to Orks, with their Mob Rule, but could come up useful every once in a while. For only 85 pts, the Warboss is a bargain, and a great HQ unit to lead your army. The Big Boss of the Orks is back to lead the great Waaagh! against the rest of the universe. 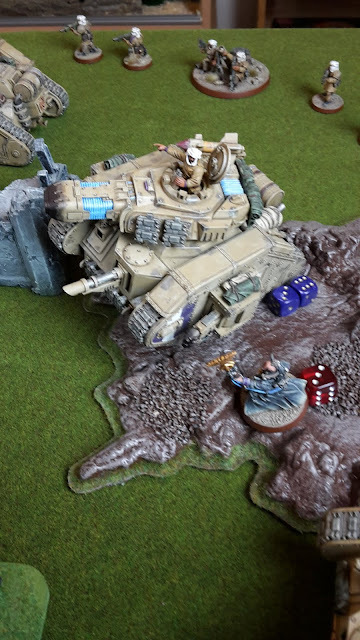 He ups the durability of a regular warboss, going up to T6, 8 wounds, a 2+ armour save and 4+ invulnerable save. This makes him very strong to enemy attacks. He also remains at movement 5, unlike other Mega armour models that generally move at 4". He gets 6 attacks in combat, hitting on a 2+ with his power klaw, so a nice bonus for doing more damage in combat. He also gets the same abilities as the Warboss, allowing you to advance and charge, as well as giving morale boosts to nearby units. He is pretty expensive at 235 pts, so not sure if he is worth it. You can get a bunch of characters much cheaper to buff your army more. Part 3 of my 8th Edition Ork Codex review will take a look at the Relics and Psychic Powers available to the army. The Orks have access to a number of useful Relics to add to the characters in the force to help them demolish the enemy even further. A Kustom Shoota that is 18", Assault 12, S4, AP-1 and 1 damage. This gets an extra 8 shots and AP-1 over a regular Kustom Shoota. This is actually pretty good, and you should be able to get a decent number of hits if hitting on a 5+ (along with the extra shots). This is a solid choice, but I don't know how often you will see it, as there are simply better Relics available. A big Choppa that is +2S, AP-2 and 2 damage. In addition, to wound rolls of 6+ inflicts 2 mortal wounds instead of normal damage. Again, a very solid relic to take. The chance of doing multiple mortal wounds on a 6+ is a great bonus. This is strong when added to the Monster Hunters stratagem, allowing you to do 2 mortal wounds on a 5+. Gives the bearer a 5+ Feel no Pain type save against wounds. Cannot make a Doc's Tools roll for this model if you do so. This is a great upgrade for your warlord, as most Ork characters struggle to get an invulnerable save. Gives them a chance of staying alive for longer. I think this is a useful Relic to take in the army. 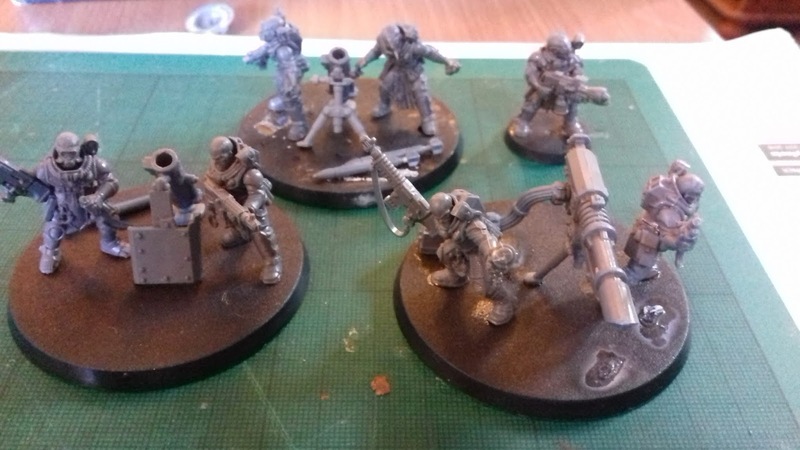 Today's Warhammer 40k hobby update features some reinforcements for my Genestealer Cults army. I wanted to add some Heavy Weapons Teams to my army for the Neophyte Hybrids squad. 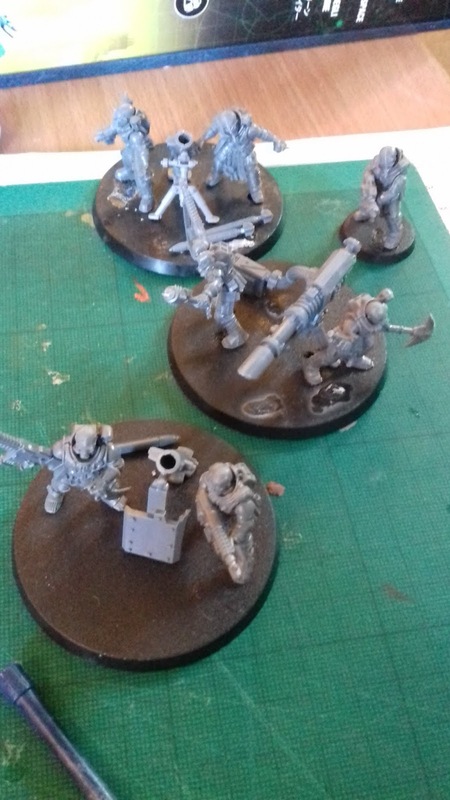 I wanted a couple of Mortar teams and a Lascannon team. The Mortars would allow me to hide the Neophyte squad and still have some firepower to contribute. The Lascannon is also useful for some strong anti-tank firepower for the army. I also added a couple of Flamers to the Neophyte squad. I figured these could go in the Shotgun squad to allow me to get close to the enemy army and roast them. 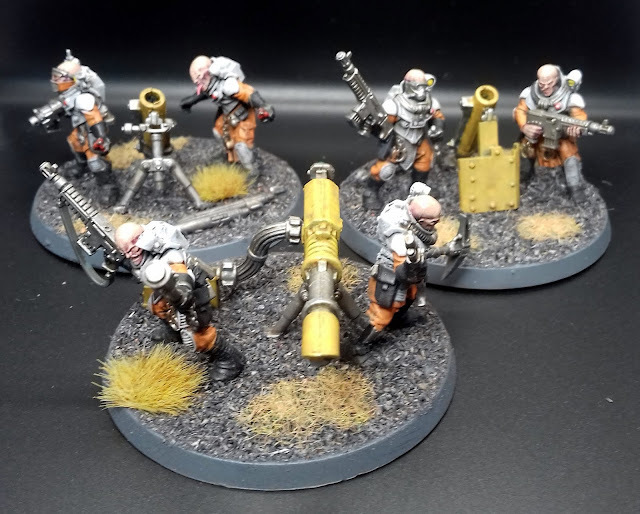 I painted up the Heavy Weapons in a yellow scheme to match my Scout Sentinels. I figured that the stolen "Guard" equipment would have a similar colour scheme. 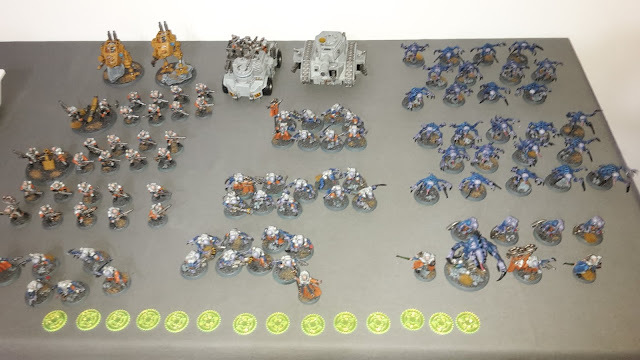 Welcome to part 2 of my 8th edition 40k Ork codex review. This part will take a look at the stratagems available to the army. The Orks get access to a great number of useful stratagems in the new codex. Some of these are generic stratagems available to other armies, while they also get some unique ones to help too. Mob Up (1CP)- Used at the end of the movement phase. Two infantry units with the same datasheet within 2" of each other may join up if one has less than 10 models and one has more than 10 models. This was the stratagem introduced in Chapter Approved last year. It is quite situational, but useful for denying your opponent kill points if the mission has them and you can meet the criteria. It is also a way to perhaps increase squad sizes of certain units to gain more benefit from stratagems. For example, you could mob up a couple of units of Lootas and get both units affected by the same stratagem. This is a solid stratagem to help keep your characters alive for longer. Used in conjunction with the Painboy's abilities, you can potentially heal 2D3 wounds on a single character in one turn. A good roll will put most characters back to full strength. Very useful. Snagga Grapple (1CP)- Use on a Deffkilla Wartrike that Falls Back. Select a unit within 1" before they fall back. On a 2+, they suffer D3 mortal wounds. 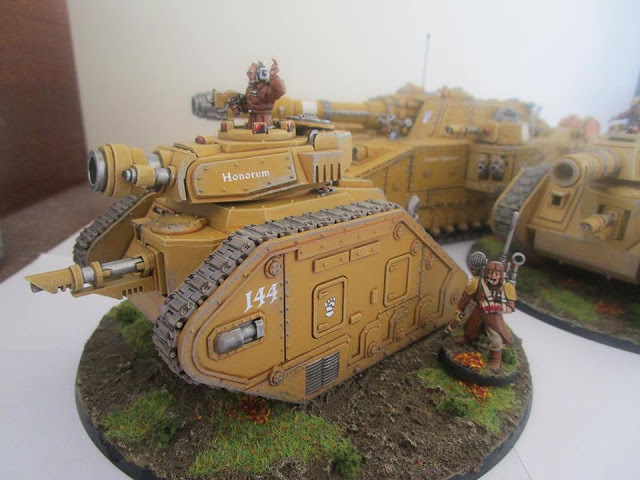 The Deffkilla Wartrike is a vehicle that has some great close range firepower and combat ability, so getting into combat is a good deal for it. The ability to fall back and deal mortal wounds is pretty strong. This gets better when combined with the Blood Axes Kultur, allowing it to still shoot or assault. 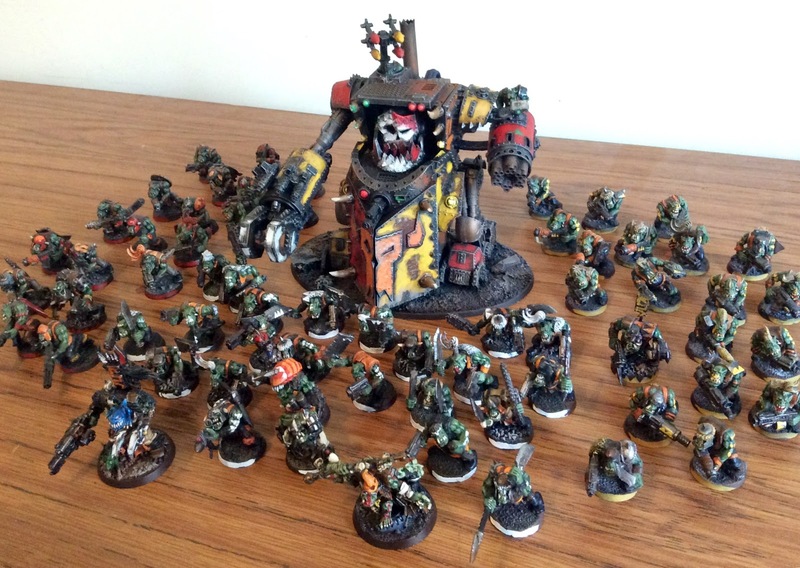 Welcome to the first part of my 8th edition 40k Ork Codex review. This will take a look at the special rules, Clan Kulturs and Warlord Traits. 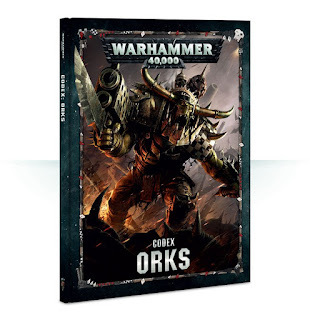 I have been eager to see what the new codex has to offer for the Orks. They were a pretty strong index army, even as other codexes came out, so was keen to see how they would boost the army in the new book. Each time you roll an unmodified 6 to hit with a ranged weapon, the hit roll succeeds, regardless of modifiers. In addition, you get to make an additional hit roll with the same weapon (which cannot generate further hits). This new special rule was previewed a while back. Overall, I like it. With Orks, it was very easy for some armies to stack up the modifiers to hit against them, making it literally impossible for your ranged weapons to even hit certain units. This ensures that you will also be able to count on your firepower to some degree in the army, rather than making it a waste of points. The bonus shots for rolling a 6 to hit are also a great bonus, both for large volume units such as Shoota Boyz, where you might get lots of hits, or for smaller units, like Tankbustas or Lootas, where every extra shot and hit with their powerful weapons are a great boost. You can re-roll charge rolls for this unit, and can choose whether to re-roll any or all of the dice. This got even better from the index version and is a huge boost for the combat effectiveness of the Orks. Getting to re-roll one or both dice is a big boost to the army. Imagine the situation where you need a 7" charge and roll a 5 and a 1. Under the new system, you can choose to re-roll the 1, giving you great odds of making the charge. Under the old system, you had to re-roll both, giving you roughly the same odds of making the charge or forcing you to use a command point re-roll on the 1 to give you better odds of making the charge. The other big bonus is that it allows you to re-roll charge rolls, not only "failed" charge rolls. For example, say you were multi-charging two units that were 3" away and 7" away. If you were to roll a 4" charge, you could contact the first unit, but not the second. You could not re-roll for free as you have not failed a charge. In the new rules, you have the option to re-roll one of the dice to allow you to have the chance of catching both units without the risk of failing the charge overall in many cases. This is also great for giving you the option to roll further on charge and opens up more tactical options, such as consolidating into other enemy units to tie them up in combat or getting further to surround a unit and stop them from falling back in the following turn.